A Modified Bitumen is a key element of a built-up roofing system. This roofing system was developed in Europe during the sixties and introduced in the U.S. in the early seventies. The term “modified” refers to the addition of plastic or rubber-based polymeric binders to the asphalt or “bitumen” to improve its roofing performance and durability. Modified Bitumen Roofing Systems are usually assembled using one, two or three plies. The Modified Bitumen Membrane itself is made up of multiple layers in what is essentially a “factory assembled” built-up roof. During the roofing manufacturing process, several coats or laminations of modified bitumen are reinforced with a woven fiberglass, or polyester fabric-reinforcing mat or a combination of both. They are then finished with either a smooth or granular top surface. The Granular type comes in different colors. The smooth surface type is then coated with either an aluminum or white surfacing on site. The coatings are used to deflect the damage from ultra-violet rays from the sun as well as keeping the Chicagoland roof surface cooler. Modified Bitumen Roofing Systems exhibits many characteristics of a built-up roof (BUR), yet affords the ease of application of a single-ply roofing system. The offering of various specifications allows for multiple plies, which provide redundancy and exceptional puncture resistance to heavy traffic, punctures and tears. Modified Bitumen membranes also have low-temperature flexibility and are resistant to membrane fatigue. APP (Atactic Polypropylene) roofing systems are applied using a heat-welded method. The top surface comes in either smooth or granular. The consistency and uniformity of the factory produced sheet results in a membrane that has greater stability and flexibility than that of a laminated built-up roof system. SBS (Butadiene Styrene) roofing systems are usually applied using hot asphalt, bonding adhesives, heat welding or heat activated self-adhesives. The top surface is a mineral granular of choice of colors. It has the benefits of a built-up redundant system with the quality of a factory single ply membrane. 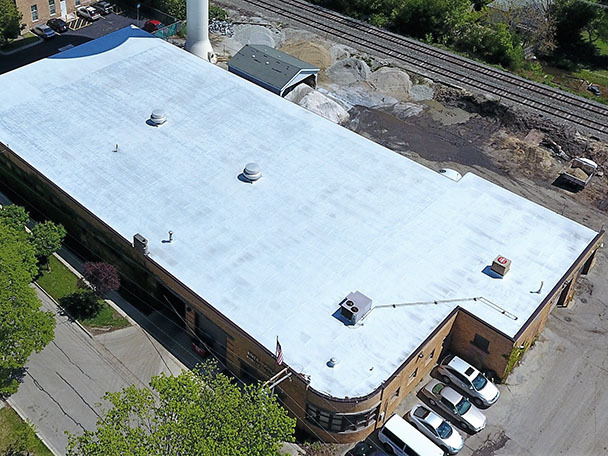 Matthews Roofing expert technicians are qualified to install modified bitumen roofing on Chicagoland commercial and industrial flat roofing systems.